Anyone else like sloppy joes? This sandwich consists of ground meat, onions, and mystery sauce from a can served on a bun. My mother used to "cook" these for us - and I had forgotten about them until recently. I found out that my husband, who is an Australian citizen, has never had a sloppy joe. But, I couldn’t serve him the school cafeteria sloppy joe because I feel it is kinda strange and too packed with just meat for my tastes. I believe that I can make it over into a healthier sandwich and no one will notice! My strategy is to remove most of the ground meat and use canned black beans. Sacrilege? Maybe, but it is cheaper, healthier, and more environmentally sound to eat less meat and while I think a sloppy joe without ANY ground meat is a bad idea- mixing in some beans turns out to be a pretty good idea. You see, the beans are fiber filled, high protein, and they go great in the sauce. And, the amount of meat added gives it that yummy meat taste to make it taste like a real sloppy joe. We don't have to give up taste and flavor to have a healthier option. Just add less meat and it works. Really. It is difficult to buy 1/2 pound of ground meat. So, talk to your butcher (they will give you the amount you specify) or just cut the pound in half and freeze the rest for later use. I double dog dare you to try this recipe! Spray non-stick pan with non-stick spray and heat to medium high. Saute onion until softened and add ground beef. Cook until ground beef is no longer pink. Add the remaining ingredients and serve on burger buns. Enjoy! Love the idea of adding black beans to the mix, that sounds amazing!!! I do a Sloppy Joe with pumpkin. Really good! Might have to try adding beans/less meat next time. Great suggestion! Jamie Oliver has a similar approach for more healthful sloppy joes that I've made for clients; quite tasty much more nutritious. I've also offered it as a topping for baked potatoes or sweet potatoes instead of on a bun - yum yum! What an awesome idea! I use ground turkey and add more veggies (Bell pepper, canned tomatoes, tomato sauce) but next time I'll have to try the beans! Never heard of adding yellow mustard, will try. Lisa, I love your idea of adding black beans and less meat!!!! I was hesitant to read the rest of your post because I was thinking "more beans". I was presently surprised by the idea of still using meat, just less. We haven't had sloppy joes in our house in a long time. This sounds good. The big question is "Do the kids like it?" What a great idea replacing 1/2 the meat. And it is so easy to make the regular kind I always wondered why people feel the need to use the canned kind. @Charlotte - my kids LOVED it. They are 6 and 8. Anything with ketchup they love. I make sloppy joes in the crock pot with lentils...really really good, and no meat! Great idea! I shall try it. We usually add some grated carrots and/or grated zucchini. Thank you for this. My husband sometimes requests Sloppy Joes and it's been difficult for me to agree, until now! This is a great idea! I am going to try it. My Aussie husband loves Sloppy Joes. They grew up eating some weird and not so healthy stuff...vegimite sandwiches, sausage rolls and meat pies. Add a pinch of Allspice & cinnamon. I was out of tomato paste one day while making a meat sauce and used ketchup..I know, bad idea, but soon realized if I added a little Allspice & cinnamon, it tasted just like sloppy joe. You can do all kinds of varieties if you just think super-thick chili! More beans! Spicy! And yes, vegetarian options, too! Make it less liquid-y so it'll sit well on the bun and have fun! My mom would make the sauce with ketchup, mustard and brown sugar. Yum! Brilliant idea! My family likes sloppy joes, but I always wished for a way to make them more nutritious. I usually add corn kernels or shredded carrots to the meat, so I think I will try your version as well. Thanks for the idea, I always forget about these and I know my kids enjoy them at school. My concern wouldn't be about reducing the meat content, because after all lean grass-fed beef is quite healthy. (Though there's nothing bad about adding beans.) What stops me dead in my tracks is the idea of using a cup of BBQ sauce or ketchup! Both are loaded with added sugar, usually HFCS, and unless you choose a "natural" brand there may be other questionable ingredients too. Tomato sauce, tomato paste, a dash of vinegar, and a bit of brown sugar or sweetener of choice works well as a substitute. I make "Sloppy Jose's" with ground turkey, bell peppers, cilantro and some jarred salsa. So easy and so yummy. We serve it with some Food Should Taste Good tortillia chips. Black beans would be perfect with this - thanks for the idea! 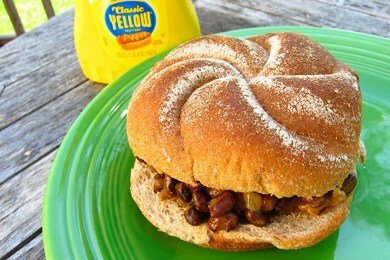 I make black bean sloppy joes all the time and they are delish! The trick is a bit of liquid smoke to give it a beefy flavor. If the texture is what you need (though honestly, I've not met a vegan yet who has ever seriously craved the texture of ground beef) you can simmer some tempeh OR even easier, a little bit of bulgur wheat in the mix. Texture is spot on and super great! My daughter loves them. What a great idea! I have also made them with ground turkey breast and they were delicious! I haven't had a Sloppy Joe in years! In fact I think the last one I had was probably about 15+ years ago. My mom used to always make them when we were kids. Looks like I'll have to try this for old times sake! I soak lentils overnight then drain. It takes like meat!